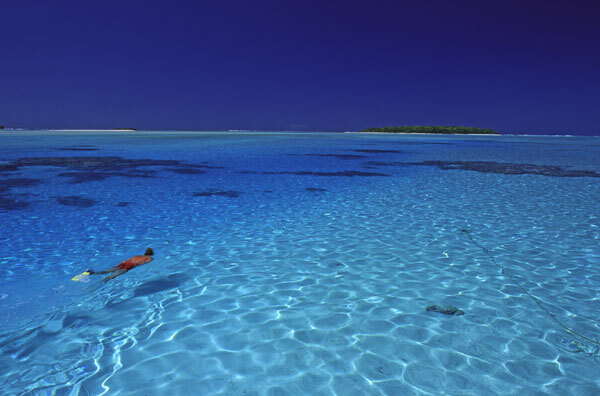 Edmonton to Rarotonga, Cook Islands - $628 CAD roundtrip including taxes | new record! Air New Zealand has dropped the price of their flights from Edmonton to Rarotonga, Cook Islands in the south Pacific down to $628 CAD roundtrip including taxes! This is a new record for the cheapest flights from Edmonton to the Cook Islands. The price drop is a part of Air New Zealand's Cyber Monday sale to New Zealand, Australia, and the Cook Islands. But Expedia seems to be showing them for far less than what the Air New Zealand website is showing. The Cyber Monday prices to New Zealand and Australia are pretty similar to what have been available at various other times throughout the year and are not as exciting. According to the CDC website, the Cook Islands do not have the Zika virus. "In short, there is no bad time weather-wise to visit the Cook Islands, although the shoulder months of April, May, September, and October usually provide the best combination of sunshine and warmth." 1. Go to Kayak or Expedia. (Some dates may only work on one or the other. It's worth trying both). NOTE: You may also be able to find shorter trips (6 day trips) if you try searching for Saturday to Friday dates in the months listed below. For trips longer than a few weeks, you can try mixing and matching the dates from different lines in the list below. Where to stay on the Cook Islands? The map below will show you some great deals on accommodations on the Cook Islands for under $99 CAD/night for 2 people. edmonton, yeg, flight deals, polynesia, australasia and oceania, air new zealand, pacific islands, rarotonga and cook islands. 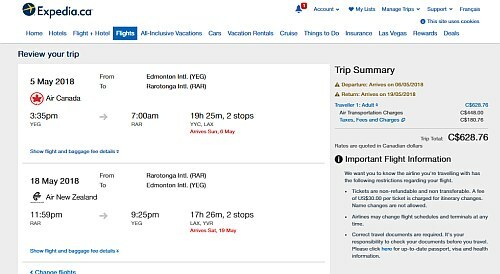 5 Responses to "Edmonton to Rarotonga, Cook Islands - $628 CAD roundtrip including taxes | new record!" Thanks so much for the great find! We booked Sept 29 to Oct 12, for $668. But the prices are on the rise as we speak. So if Kayak shows a higher price, go directly to Expedia and search. Is this still a deal i cant seem to get any good rates like ones mentioned above? Unfortunately these are gone now. The price drops were related to Air New Zealand's Cyber Monday sale. Booked on cyber Monday, over may long weekend 2018 for a week $668 RT. Thanks again Chris! No problem Matt, have a great time!